‘Then I understood it,’ says the boy, Axel, ‘To make them hear me, all I had to do was to speak with my mouth close to the wall, which would serve to conduct my voice, as the wire conducts the electric fluid’ (Verne 1864). Fig. 1: William Blake, The Angel of Revelation, (pen & watercolour, 393 x 262 mm) c.1805. By timing their calls, the group of explorers work out that Axel is separated from them by a distance of four miles, held in a cavernous vertical gallery of smooth rock. Feeling his way down towards the others, the boy ends up falling, along with his voice, through the space. Losing consciousness he seems to give himself up to the space. Is that what I’ve done? Verne mentions the whispering gallery of St Paul’s Cathedral. He describes how a voice spoken into the curve of its wall can be heard from the other side of the gallery as clear as a bell. Unless you move away from its line of flight. Then nothing. I’m gone. For the setting of Journey to the Centre of the Earth, not the domed ceiling of an Anglican cathedral but the descending strata of the Earth’s core, Verne had in mind a more ancient example found in the caves of Sicily: The Ear of Dionysius. A mysterious s-shaped grotto with spiralling, 74 feet high curved walls that resemble the inside of a gigantic human ear. It was formed out of an old limestone quarry known as Latomia del Paradiso, near the city of Syracuse, probably as early as the 6th century BC. According to legend, the tyrant Dionysius established the cave as a panaudion prison, using its perfect acoustics to listen in on the whispered conversations of his prisoners (Sabine 1922). The Ear of Dionysius is said to have been named by the painter Caravaggio. On the run in Sicily near the end of his troubled life – in 1609, the year before he died – sleeping fully clothed, weapons by his side, he may have even hidden there. No doubt hoping not to hear another voice or have his own overheard (Langdon 1999). Stories of caves and voices seem to cast a prehistoric shadow, perhaps of the oldest buildings, or an echo of the earliest human speech. Much later, St John the Apostle is said to have transcribed the Book of Revelation in a cave during his exile on the Aegean island of Patmos. My own tale of whispering galleries and messages traveling on currents of air also begins in tunnels and subterranean passages. Cold and dark, and distant. Though in Jules Verne’s story, the voice – which always exists in a kind of darkness since it cannot see or be seen, yet it can apparently reveal things that are obscured or invisible – helps the lost boy Axel, trapped inside the hollows of an unknown body, to find a way back to his companions. Fig. 2: Correggio, The Vision of Saint John on Patmos; Parma, church of San Giovanni Evangelista, 1520-1524. O’Hara once whispered to me, as calm as a pencil (O’Hara 1977). Because on the subject of both air and Patmos, historian Hubert Damisch recommends one of the famous ceiling frescos by another Italian painter, Antonio da Correggio (Damisch 1972). The popular theme of John the Apostle provides an image of at least one biblical text in a key stage of pre-production. John is usually shown writing The Book of Revelation, as it is spoken to him in a vision inside the Patmos cave. Paintings by Velasquez (c. 1618), Alonso Cano (from the mid 1640’s), Poussin (around the same time), and many others, show John, pen in hand, transcribing as what can only be described as an Almighty dawn deadline approaches. In other versions of the same scene, including well-known examples by Hans Memling (1479), Hieronymus Bosch (1485) and Tobias Verhaecht (1598), we meet the angel whose task it is to relay God’s message as a spoken ‘press release’. In Memling’s Saint John altarpiece in Bruges, the message is aimed at John in the form of an arrow about to be fired from a bow. William Blake’s pen and watercolour The Angel of Revelation (c.1805) shares with Correggio’s Vision of Saint John the low-key presence of an Apostle pictured as an almost incidental character. In Blake’s painting, John is a tiny figure with his back to us, sitting on a rock beneath the towering messenger angel that fills the image. Damisch says that in Correggio’s painting the Apostle is ‘so well concealed by the jutting cornice that for a long time the painting was regarded as an Ascension rather than the vision of Christ that appeared to St John on the island of Patmos as described in the Apocalypse.’Symbolic images of turbulent skies and drifting, evaporating clouds contradict the inscribed orderliness of landscapes and biblical scenes painted with perspectival precision. Images depicting John on Patmos register the presence of another ethereal form occurring partly in the air: the voice. In a painting though, this can neither be seen or heard, as if it were long gone. Or perhaps, for technical reasons, still to arrive. Fig. 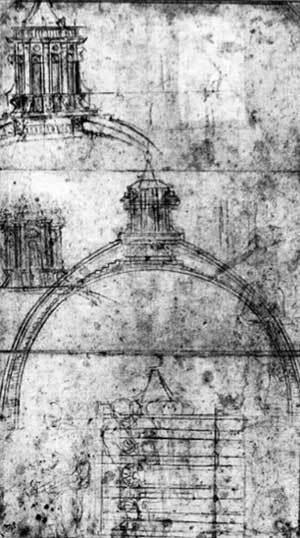 3: Michelangelo’s sketches for Saint Peter’s dome showing a double shell dome and a lantern. c.1550. December 12, 1901, the Poldhu Cove Wireless Station in Cornwall announced that a signal from its spark transmitter had reached Guglielmo Marconi at a receiving station in the suitably named location of St John’s, Newfoundland. The message had travelled 3500 kilometres. Was that incoming crackle of atmospheric noise really the Poldhu Cove transmission? Marconi had requested the Morse code letter S, three clicks, to be sent at 12:30, 1:10 and 2:20, local time, and that is what he claimed to hear. What we do know is that long-distance radio communication, as pioneered by Marconi, can be guided by radio waves flowing between the parallel conducting surfaces of the Earth and its ionosphere. The same guiding action that allows sound to ‘cling’ to the curved wall of a so-called whispering gallery. For radio transmission there are other factors: frequency and angle of incidence, the activity of the Earth’s magnetic field or of the sun, even the time of day or the season. But lower radio frequencies will follow the curving surface of the earth according to a principle known as ground wave propagation. This allows radio waves to circulate in the space between the conductivity of the ground and the charged particles of air that form a boundary of the ionosphere. And this type of wave, or particularly the way that it holds to a curved surface, is commonly referred to as the whispering gallery effect. And though it is now known to occur throughout physics, in optics and astronomy as well as acoustics, it was named after a study of the whispering gallery at St Paul’s, by the Nobel Prize winning physicist JWS (Lord) Rayleigh. The mysterious ghostly whispers of St Paul’s were previously believed to be a focusing effect involving sound reflected from one specific point to another. But this failed to explain why a whisper could be heard clearly at any point along the gallery’s entire circumference. Studying the acoustics of the dome in 1878, Lord Rayleigh observed the movement of sound in the gallery, by registering the directed sound of a whistle in the flickering flame of a candle some distance away. Publishing his study in 1910, Rayleigh described how the ‘whisper seems to creep around the gallery horizontally (…) along that arc toward which the whisperer faces’ (Rayleigh 1910). Marconi’s aims for the radio transmission of sound seemed to stake out the open air of space as a vast site in which to construct an architecture of the voice. The already voice-transmitting whispering gallery effect must have seemed like a minor curiosity at that time. Yet the interior spaces of churches and cathedrals like St Paul’s or the Pantheon in Rome were equally ambitious designs for the voice. The Romans had perfected the acoustic vaulting of architectural space, with the dome replacing the vault of the sky, through which voices could project like stars or float like winged angels. The Basilica of St Peter’s, completed in 1547, is still the world’s largest dome – 138 meters high and 42 meters in diameter – with a whispering gallery activated in the upper part of the cupola. It was designed by Michelangelo. Sir Christopher Wren’s construction of St Paul’s Cathedral, completed in 1708, closely followed the design of St Peter’s. And produced an equally impressive whispering gallery. Though as American physicist and pioneer of modern architectural acoustics Wallace Sabine pointed out, the conditions that enable the whispering phenomena occurred more by chance than by design (Sabine 1922). Before Lord Rayleigh’s study of St Paul’s, Horace Lamb, a mathematician at the University of Adelaide, Australia, published in 1882 a theory of vibrational wave propagation. Others before him were well aware of optical equivalents to what would only much later become known as whispering gallery waves. Theodoric of Freiburg, a 14th century theologian and physicist, explained the formation of a rainbow after observing rays of light curving around the concave interior of a raindrop. And by 1900, a Brazillian inventor named Roberto Landell de Moura, also a theologian, had not only written about sound waves but was able to publicly demonstrate, well ahead of Marconi, radio broadcasts of the human voice. Landell de Moura had been ordained as a Roman Catholic priest in Rome in 1886, and was no stranger to St Peter’s. He also used his time in Rome to continue studies in physics and chemistry where he began to focus on the wave propagation of sound. There are four radio-related patents under his name, one of them described as a device ‘appropriated for the transmission of the word at a distance, with or without wires, through space, earth and water’ (Fornari 1960). On June 3 1900, De Moura transmitted his own voice by radio from a hill top on Avenida Paulista to the summit of Santanna Hill, a distance of 8 kilometres across the city of São Paulo. Fig. 4: St Paul’s Cathedral on the night of December 29th, 1940, photograph by Herbert Mason. Landell de Moura, or as he would have been known at confession, Father Roberto, had a reputation for challenging the limits of what was ordinarily expected of a voice: ‘Give me an ondulatory movement as extensive as the distance that separates us from other worlds that role above our heads, or under our feet, and I will send my voice there.’ Statements like that were not appreciated by all of his fellow ecclesiasts. But the ‘Landellian wave transmitter,’ patented in 1904, established de Moura as a key pioneer of wireless telephony. My own confessions to Father Roberto might reveal the improbable existence as a fully pneumatic voice. Alive as the air, not breathing it. I could try to describe the terrifying pleasure of being blasted across space in a hail of ionized rain when the radio waves transmitting me cross paths with a meteor shower. Or how about being hurled into a frenzied array of spiraling electrons during one of those late-night radio auroras triggered by a solar storm? A voice is a kind of Hermes, a bearer of messages moving freely between all of de Moura’s worlds, mortal and divine, physical and immaterial, above in the air and below, beneath the ground. Early experiments with radio transmission sent the voice sweeping across space like an arrow in the wind. Hoping for the best but often falling to earth, mission uncompleted. The concrete acoustic mirrors that lay abandoned along the British coastline could be a memorial to these trial runs. Installed after World War I as early warning devices for incoming enemy aircraft, they resemble small scale whispering galleries but seem strange by the inaccurate explanation of the whispers as a singular focusing effect. In the build up to the Second World War, the invention of radar confirmed a sense that sound can be received everywhere along the curved surface of the earth, though from then on transmission would become electronic, and so would reception. 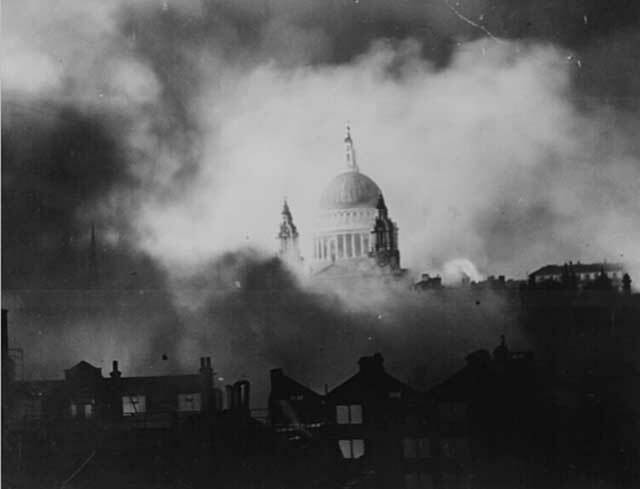 At the height of the London Blitz, St Paul’s survived a direct hit when an incendiary bomb crashed through the lead roof of the dome and lodged in the timber frame of the ceiling. Burning through the wood, the bomb dropped down into the nave, whistling through the whispering gallery, without exploding. In a famous photograph, taken by Herbert Mason on the night of December 29th, 1940, the dome rises solemnly as ever through the haze and black smoke of the attack that had been intended to set off the second Geat Fire of London (Johnson 1980). Mason was chief photographer of The Daily Mail, and the image records the view from the roof of the newspaper’s offices, behind Fleet Street, looking east across the burning city and up Ludgate Hill to St Paul’s. A distance of about a quarter of a mile. The Daily Mail hailed the image on its front page as the ‘greatest photograph of the war’, a kind of ground wave propagation supporting Churchill’s radio voice. In Michael Moorcock’s novel of the city, Mother London, a group of Blitz survivors who meet as out-patients of a hospital psychiatric ward, are connected not only by the shared experience of wartime urban destruction but also by a constant stream of London voices that continue to haunt each of them long afterwards. In a chapter set during the 1960’s, one of the friends, riding on a London Underground train, recalls using the subterranean network as ‘a means of blocking her voices’ – fragments of speech transmitted ‘on little currents of air that carry the voices of all our times’ (Moorcock 1988). The next station is St Paul’s. This is a Central Line train to Epping. Fig. 5: Russell Powell BASE Jumping from the Whispering Gallery, St Paul’s Cathedral, London, 1990. The post-war world of mass telecommunication offered few hiding places from the sound of the human voice. Not long before, it would have been impossible for most people to imagine the spoken word being shipped long distance like writing – ‘Again I listened; and this time I heard my name distinctly pronounced: cast as it were into space’ says the boy in Jules Verne’s novel – or the far-off sound of a powerful signal horn – ‘I heard behind me a great voice, as of a trumpet…’ says John the Revelator. As telecommunication moved on from smoke signals, flags and coded drumming, satellite telephony extended the transmission of the voice as if it now had some key role in a form of extreme sport. Though in throwing the voice as far as you can how do you know you are not throwing it away? Fig. 6: Occupy Saint Paul’s. Journalist and travel writer H.V. Morton, writing about London during the 1930’s, describes climbing the 259 steps up to the whispering gallery, making it to the top almost out of breath: “suddenly I heard a whisper. I looked across to the other side of the gallery. The guide was whispering against the wall. His message came to me like a spirit voice from beyond… ‘The diameter of the dome is a hundred and eight feet,’ said the Voice.” (Morton 1940) “It went on,” says Morton “to tell the story of the dome and its designer…” A story that has far more to do with idealized catenary curves and formal perfection than the informalities of the human voice. Whispering would not achieve much in the camp outside St Paul’s cathedral. Instead the human microphone proposes a kind of shouting gallery, a way of engaging and mobilizing a crowd by giving a body back to each of its voices. Perhaps it can also be heard as a collectivised response to the pervasive and ghostly machine languages of technology, which carry an invisible and mocking presence all their own. We heard it first during the WTO conference in Seattle in 1999. 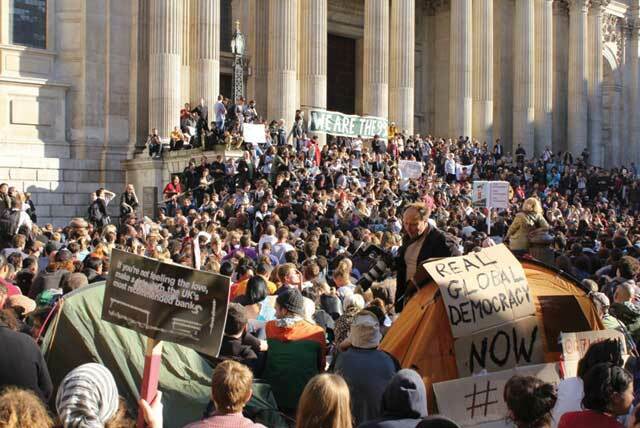 Then again in the film that followed those protests, taking its name from a chant that was used on the streets at the time: This Is What Democracy Looks Like. And if a voice represents power only for those who have both, this collective chanting might be a performative demonstration of what democracy sounds like. Jules Verne demonstrated a variant use of the human microphone when he had Axel devise a way of calculating the dark, cavernous distance separating him from his companions. Lost… in the most intense darkness. It can’t be wrong to want to measure the distance between language and where or who we are, whether following its movement in the flame of a candle or in the collective energies of a crowd. Damisch, H 2002 A Theory of /Cloud/. Stanford CA: Stanford University Press. Fornari, E 1960 O Incrível Padre Landell de Moura. Sao Paulo: Editora Globo. Franke, H W 1958 Wilderness Under the Earth. London: Lutterworth Press. Johnson, D 1980 City Ablaze: Second Great Fire of London, 29th December, 1940. London: William Kimber. Langdon, H 1999 Caravaggio: A Life, New York: Farrar, Straus and Giroux. Moorcock, M 1988 Mother London. London: Secker & Warburg. Morton, H V 1940 H.V. Morton’s London. Being The Heart of London, The Spell of London and The Nights of London in One Volume. London: Methuen & Co Ltd.
O’Hara, F 1995 Sneden’s Landing Variations. In: The Collected Poems of Frank O’Hara. Berkley and Los Angeles: University of California. Rayleigh, Baron J W S 2011 Scientific papers (Vol. 5: 1902–1910). Cambridge: Cambridge University Press. Sabine, W 1922 Whispering Galleries. In: Collected Papers on Acoustics. Cambridge, MA: Harvard University Press. Verne, J 1864 Journey to the Centre of the Earth, Paris: Pierre-Jules Hetzel (London 1871).